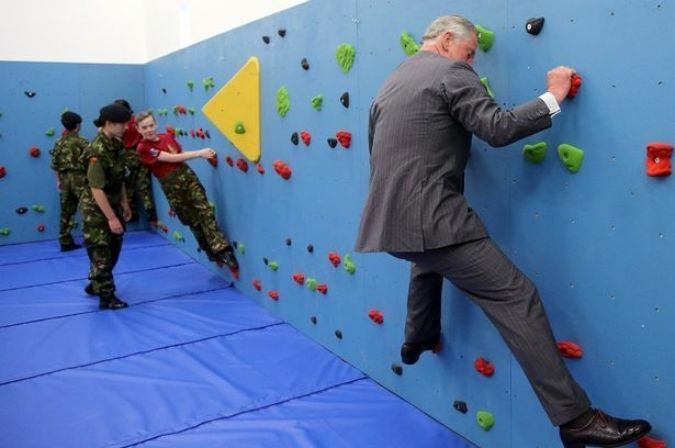 During a visit to Grainville School in St Helier, Jersey on 18 July, His Royal Highness The Prince of Wales was invited by members of the school's Army Cadet Force to try out their climbing wall. Despite the fact his business suit and smart shoes weren't best suited to the task, he accepted with enthusiasm. Headteacher John McGuinness said: "Among the young people in the gym, he will have earned some street cred". Prince Charles shared his time on the wall with some of the school's Army Cadet Force members and opened a new building housing the sports equipment and a canteen. He was accompanied on the visit by Her Royal Highness The Duchess of Cornwall.